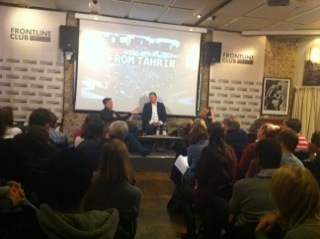 The Frontline Club last night hosted an exclusive screening of an Al Jazeera documentary Tweets from Tahrir. The film, set to be broadcast on the network for the first time on Thursday, portrays the uprising in Egypt from the perspective of five Twitter users active in the Tahrir Square protests. After the screening, three men heavily involved in the creation of the film took part in a question and answer session with the audience. For this, cameraman David Niblock, who had introduced the film, was joined on stage by director Damian Clarke and Adib Nessim, the producer and editor. One of the more pressing questions on the lips of audience members was how and why, out of all the people involved in the Egyptian uprising, were these five individuals chosen for the documentary. Clarke admitted there was some bias involved. He said: “This all started from reading Nadia [Idle] and Alex [Nunns’] book Tweets from Tahrir. There were quite a few – about 20 I think – tweeters in there and so we picked from them. Niblock, though, pointed out that this should not take anything away from the film, and that it was not designed to be portray an entirely objective view of the events of Tahrir Square. Asked if any progress has been made in Egypt since the film was made, the trio were keen to impress that the country’s revolutionary fight was far from over. Nessim said: “We stopped filming a matter of weeks ago so this really is as up-to-date as it can be.